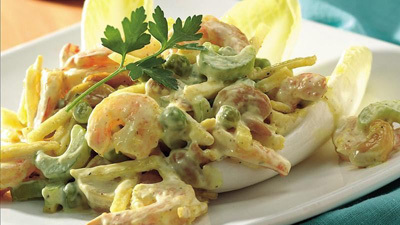 ﻿ Curried Shrimp Salad - Merwanjee Poonjiajee & Sons Pvt. Ltd.
2 (5 ounce) pkgs. frozen, tiny shrimp thawed. 1/2 cup thinly sliced cucumber, peeled & seeded. Pat Shrimp dry, & in a medium bowl toss together shrimp, apple, cucumber & scallion. Chop the fruit finely & preserve the liquid. Add fruit to shrimp mixture. In another bowl, mix together yogurt, mayonnaise, curry, dill & reserved chutney liquid.